As competitive as the used car market can be, it’s a reliable money maker for entrepreneurs that do their homework. In the United States alone, the industry is worth at least $115 billion annually and employs at least 280,000 people. Obviously, there’s plenty of money to be made buying and selling used automobiles. It’s really just a matter of buying low, selling high and knowing the local automotive marketplace. Here’s a quick car-flipping business blueprint to get you started. The easiest way to start a car-flipping business is by going after local buyers. Getting a handle on the most popular used cars and trucks in your immediate area should be pretty easy. Zeroing in on the best price points to pursue is a little trickier. Request used car sales statistics from the department of motor vehicles to get a clearer picture of industry trends in your state. Once you’ve accurately gauged local demand, you can come up with an effective business plan. There are a number of different ways to build a car-flipping business that consistently rakes in the dough. Most flippers buy a used car, register it and sell it to the highest bidder within a short time frame. Cars and trucks that can be sold for between $2,000 and $4,000 are a good place to start. You can move on to more expensive models later once your business is on firm ground. It’s also wise to specialize in a particular class of vehicle such as sub-compact sedans when you’re first starting out. Depending on where you live, starting a car-flipping business can cost as little as $500. Every jurisdiction has a limit on how many cars you can flip before you’re considered a dealer. If you have to register as a dealer, start-up costs can rise significantly. You should have at least $2,000 on hand when you get started to ensure success. If your credit is decent, you can borrow that first car payment from your local credit union. At a minimum, you’ll need a home office to keep track of expenses and revenue. A decent PC, an all-in-one printer and a filing system for hard copies of paperwork will suffice. You’ll also want a garage to store cars while they’re waiting to be sold. A few cleaning products like Armor All wipes and a shop vacuum are a must. If you plan on tuning up cars before you re-sell them, the usual tools like floor jacks and ratchet sets are required. To begin with, many states have restrictions on how many cars you can own in any given year without being considered a dealer. In Vermont, the limit is 12. In other states, flipping more than one car in a calendar year is enough to qualify you as a dealer. Research your local regulations and base your business in a neighboring state if need be. Look up the tax ramifications of selling cars for profit before you start. The key to making it in the car-flipping game without suffering show-stopping setbacks is paperwork. When you buy or sell a car, you need to establish a rock-solid chain of custody via registrations and bills of sale. Have a local attorney advise you on the best way to draft sales contracts to ensure that you don’t have problems down the line. Know that there’s a de facto “lemon law” called the warranty of merchantability that’s applicable to car sales made by dealers. Most successful car flippers rely on the expertise of a few different specialists to make wise decisions. If you’re not great at fixing cars, find an affordable mechanic that you can trust. A competent lawyer can help you to navigate various local laws and ordinances. Local business owners can be a great way to funnel customers to your venture. The point is that you should network with as many professionals as possible. Tracking down the actual merchandise that you’ll be selling is pretty simple. Craigslist is the best way to get the goods since you can negotiate pretty easily if you know what you’re doing. Use Google Alerts to notify you of cars that meet your criteria. Government auctions are another great way to find amazing deals on used cars. Use sites like SaferCar and Lemon Checks to vet potential purchases to avoid being scammed on damaged vehicles. The best way to move cars is by listing them on digital exchanges like Craigslist, Autotrader and CarGurus. If you want to accelerate the flipping process, you should meet prospective buyers at their homes or workplaces for test drives. Parking cars next to main thoroughfares with a “For Sale” sign in the window is another way to go. Get to know local business owners that will allow you to use their lots to display your cars. It should go without saying that you’ll get a better price on your vehicles if you give them a makeover before you flip. You should sign up for member accounts with parts vendors like Advance Auto and AutoZone to get discounts on windshield wipers and cleaning supplies. When listing your cars online, take many high-quality photos of your merchandise to attract only serious buyers. Give yourself some breathing room in the cash reserves department to avoid being forced to sell at a loss. While you don’t need to brand yourself or your operation to succeed in the car-flipping game, doing so can substantially boost your profits. You should set up a basic site where you can list cars that you’re currently selling using WordPress or Squarespace. Printing up a few business cards that you can hand out is never a bad idea. The idea is to establish your reputation as a reliable source of decent used cars at fair prices. If you want to earn more while working less, flipping increasingly pricey vehicles is a wise idea. If you sell just one car per month at an average profit of $3,000, you’re looking at a healthy side income. You can quickly go from flipping vehicles in the $4,000 range to selling luxury models that run $30,000 by consistently reinvesting profits in the business. 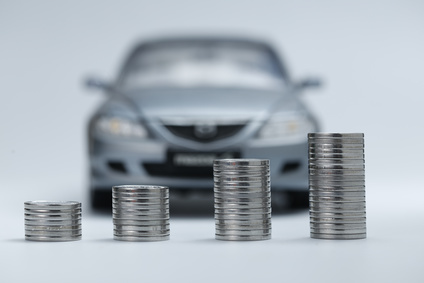 However, you may find that sticking to the lower end of the used car price range is more lucrative. At some point, you may want to make your car-flipping concern a full-time business. To do so, you’ll need to become a registered dealer. This will typically require a license from your state and a surety bond at the very least. You could also stretch your income by tracking down cars for other vendors and earning a finder’s fee. At the end of the day, there’s no limit to how much money you can make flipping cars if you keep your eyes peeled for deals.